Doncaster Rovers’ winger Matty Blair reckons his side are the 'best team in the league' ahead of their clash against top of the league Luton Town this weekend. Blair, who scored and assisted the winner in the reverse fixture against Town, was speaking with full confidence this week despite his side being without a win in their last seven outings in all competitions. That run of fixtures includes a trip to the Stadium of Light - where Sunderland are unbeaten this season - and a potential grandstand finish against fellow play-off contenders Coventry City. The Donny player has been used in a utility role this campaign, being deployed often as a full back or central midfield, rather than on the flank where he has played for most of his career. His statement seems rather ill-timed as Doncaster lay in 19th place in the form table, while fellow promotion candidates, Sunderland, Luton, Coventry, Barnsley and Charlton are in the top-six. Black Cats fans maybe surprised by his words, as they beat “the best team in the league” earlier in the season at the Keepmoat Stadium as Chris Maguire netted in a 1-0 win. The Wearside club are also 16 points clear of Donny and have stayed above them in the table since early October. Blair had more to say as they prepared for their trip to Kenilworth Road, justifying his optimism: “I know Luton haven’t lost at home all season and it’ll be a tough game but I’m confident we can go there and get a result. "I've said it from day one I believe we’re the best team in the league. "That’s no disrespect to anybody, that’s just what I believe. 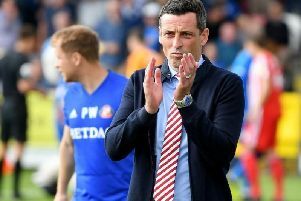 With the Black Cats out of action this weekend due to international call ups, fans will hope their is some truth in Blair’s words as Sunderland look to chase the leaders with their games in hand - despite Luton currently have a seven point lead.